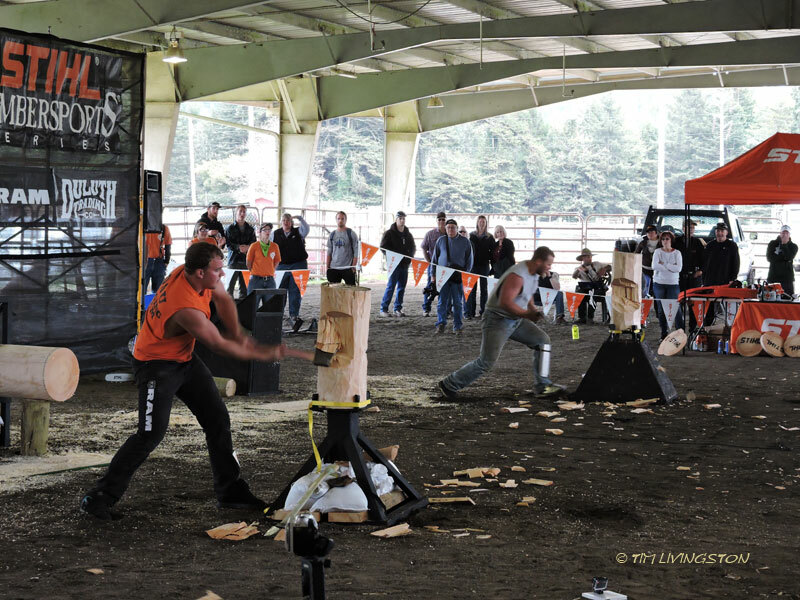 A speed chopping contest between Oregon State University and Shasta College students. Logging sports like this were inspired by how it was once done. Every time I see a news report where the reporter says loggers “chopped” down trees, I want to bang my head against the coffee table. 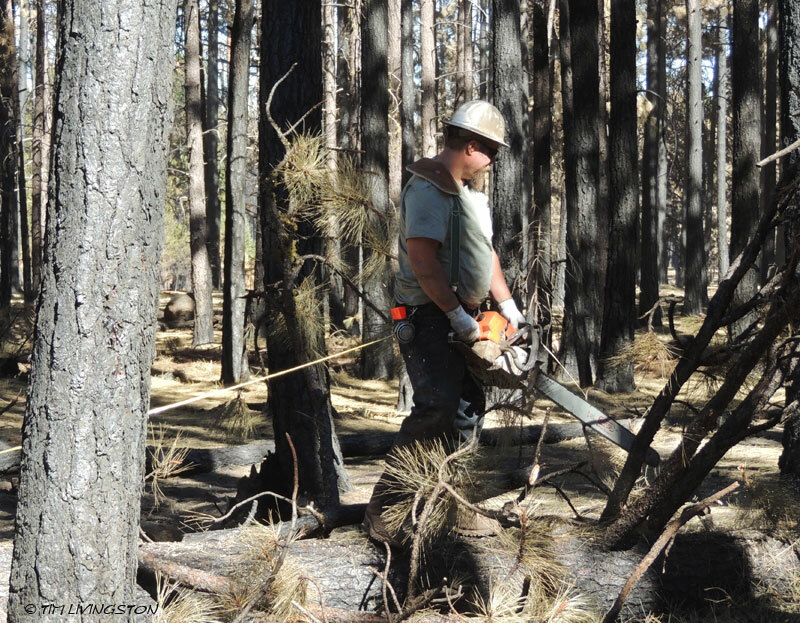 Loggers haven’t chopped down trees since chainsaws took over the job in the 30’s and 40’s. Using a chainsaw to limb a Ponderosa pine tree. Chainsaws are still on every logging job, but now they share much of the tree falling duty with the feller bunchers. These machines look more like something from Star Wars. 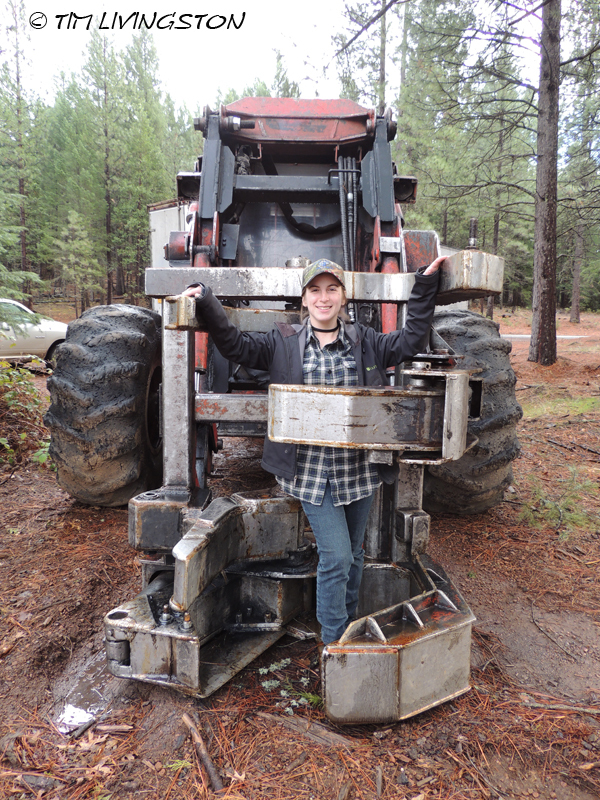 It’s not what most folks would expect on a logging job. The disk on the front of the feller buncher is the saw blade. This type of saw head is called a “hot saw” because it runs constantly. 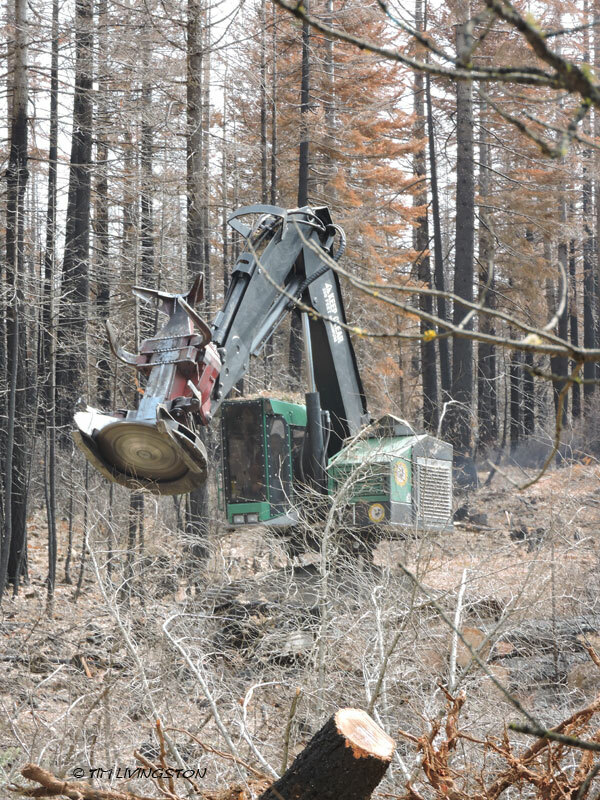 This machine is working on a fire salvage operation from last years wildfires. They cut trees all day long. They grab the trees when they cut them. The trees are then stacked up in a “doodle” for the skidders to take to the log landing. Life is a lot different for the loggers these days. Working in an air-condition cab is a world away for the days of axes and misery whips. This tree shear is another example of tree cutting technology. Don’t worry, we let her go. This entry was posted in Forestry, Wildfire and tagged axes, chainsaw, fallers, falling, feller-buncher, felling, Forester Artist, forestry, loggers, logging, timber by foresterartist. Bookmark the permalink. Very interesting. I had never heard of these tree cutting machines. They are very common here. It is a much safer way to cut trees. Hey Tim, it looks like there is a rope tied to the chainsaw guy. What is that? That’s his Spencer Tape or logger’s tape. He’s using it to measure the log lengths for bucking the tree. It has a bent horse shoe nail on the end of it that allows him to stick it into the end of the log. Who knew?? I always thought there was a particular talent to being able to fell a tree in the direction you wanted it to go. Guess there’s not much of a learning curve anymore with this equipment? There definitely is a talent for falling a tree in the direction you want, with a chainsaw. However, the feller butchers have there own steep learning curve. Never mind just learning the controls and computer system that run it. They have to learn how to operate on steep slopes without tipping it over. They have to be able to operate in an area without damaging the trees that aren’t being harvest. economy of motion is critical from maximizing efficiency. They have to service them everyday. 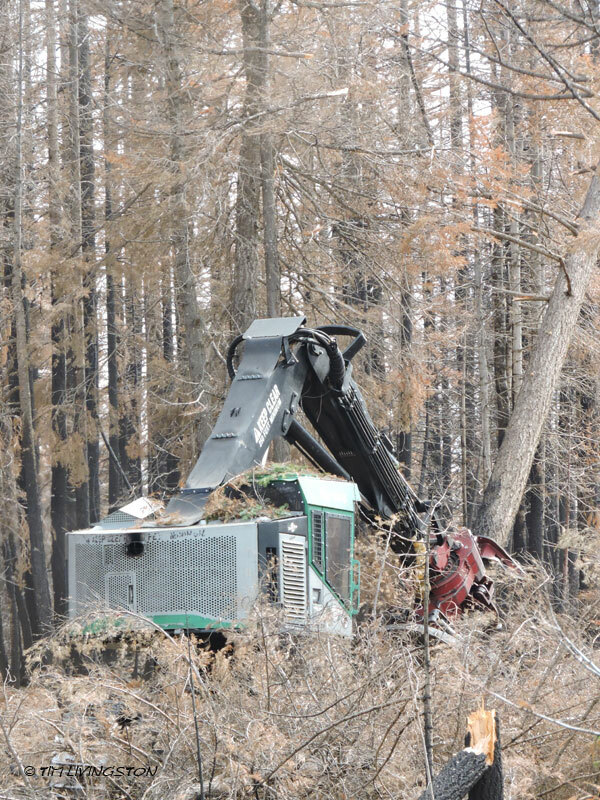 Even dropping the trees has to be done in a way the doesn’t damage the residual trees and leave a organized “doodle” or pile of trees that the skidders can easily move to the landing. I’m probably leaving out about a dozen other items. I assume you wanted to bang your head on a “wooden” coffee table. Thanks for an informative post! Thank you so much Dina! It’s very nice to hear for you. Happy Easter to you and your family. As ever Tim great information about how things are done these days. It also reminded me of the recent death of Vic Summers at 96, who won the world tree felling championship 8 times. He was still participating in the masters series in his 90’s. You’d be amused to hear that he at one stage hung up his axe for the ‘easier’ sport of sawing. On his first outing at the Gympie show he won the Open Veterans Handicap Sawing. The sport of wood chopping is still a draw card at Australian country shows and will be a feature of this weekend’s Royal Easter Show in Sydney. Great story Leonie! I hope I’m as vibrant when I get that far along. Thanks for sharing the great photos. Love that I learn so much here. Very interesting post. Wonderful piece of machinery in the hands of experienced men, but can be devastatingly dangerous in the hands of a fool. Ha! That would probably appear in one of your posts! My parents had their land harvested for lumber a few years ago. It was crazy to see these machines take down trees with such little effort; when my grandparents built their house they used a cross cut saw to clear the area in the woods of New Hampshire. My grandmother still has the saw they used hanging on the wall as a decoration- times sure have changed! Very cool! What did you Grandfather think of the mechanized logging? Unfortunately he was not longer around when the lumber was taken, but I’m sure he would have been impressed at the sight! I bet he would have. You could catch a lot of them with that Ralph. We would have to change the name to A Feller’s Buncher!